I know. 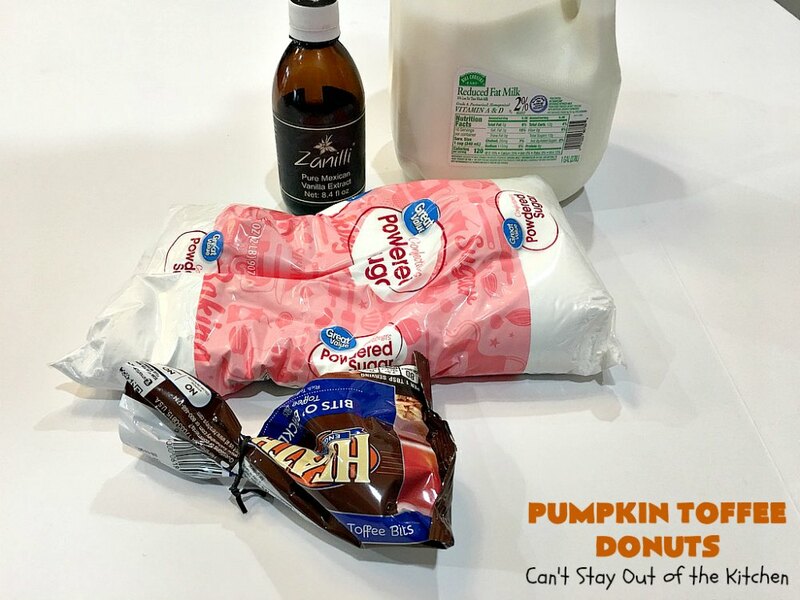 You’re probably wondering by now: Another donut recipe?? Yes! Pumpkin Toffee Donuts. Let that sink in. 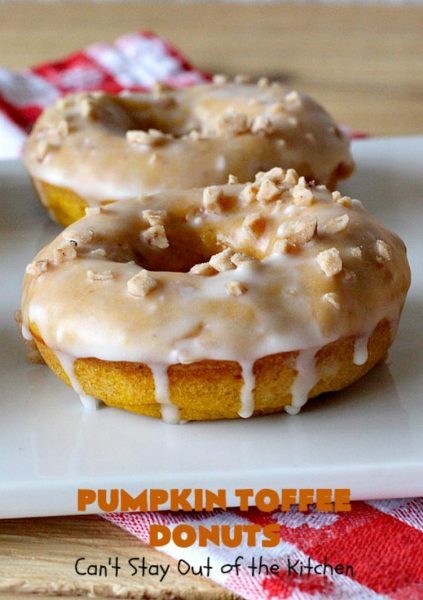 These luscious Pumpkin Donuts have Heath English Toffee Bits inside the donut and on top of the icing glaze. 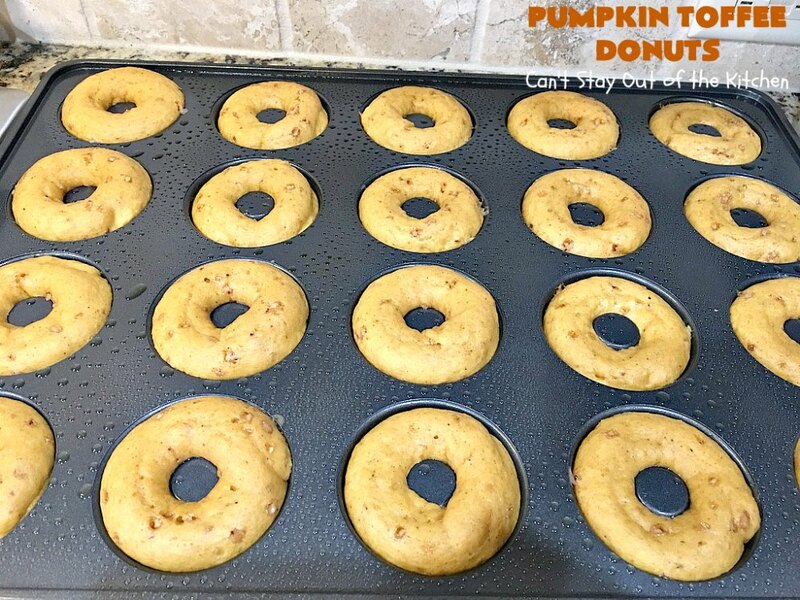 They are some of the most mouthwatering donuts I’ve ever made. And I’ve made plenty! 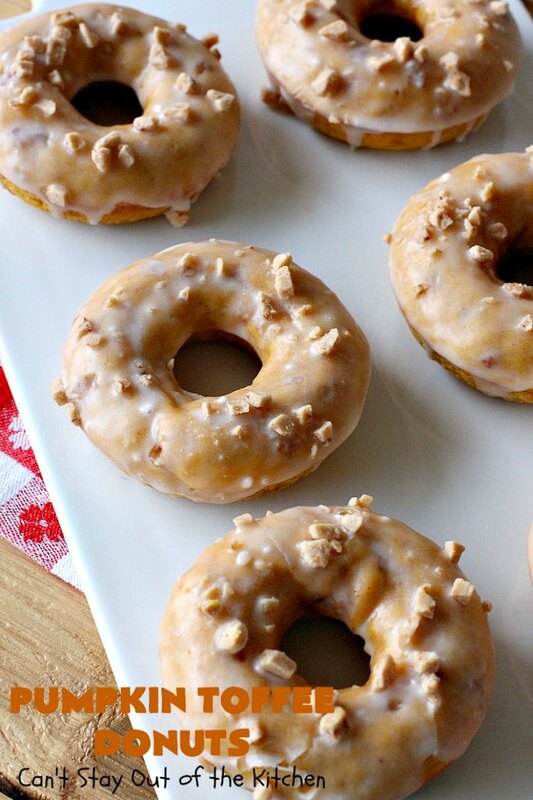 Truly, these donuts are so drool worthy. You won’t be able to put one down once you start eating. Back in February we hosted a “Breakfast For Dinner” night for our Friday night care group. Among a lot of other things, I made two kinds of Pumpkin Donuts. They were both fantastic. But I have to admit, the richness of these donuts had me hooked. 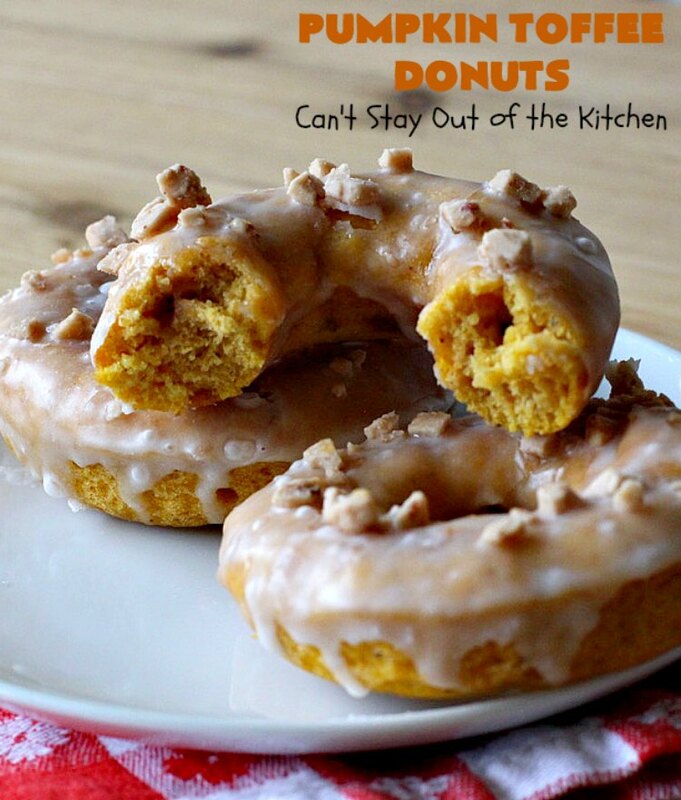 Every single person that tried these donuts oooohed and aaaahhhed over them. Just about everyone took a few home to eat later. John took the remainder out to his office where they always are well received. I know you look at the ingredients list and say, “Nah, that’s too difficult for me.” Don’t do it! These donuts really are not that difficult to make. You combine the dry ingredients. You combine the wet ingredients. You combine both with the Heath English Toffee bits, and you’re done! After baking, you glaze the donuts in a simple vanilla icing. 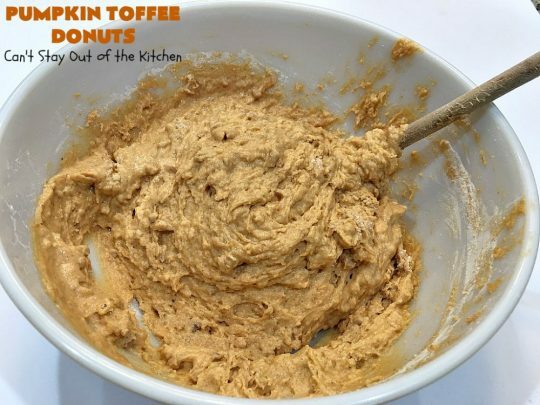 Then you sprinkle each one with a spoonful of additional Heath English Toffee Bits. After that, you eat and enjoy! I’ve had a lot of people ask me where I got my large 20-cavity donut pans. I live in the Dallas metroplex area. We have a chain of grocery stores called H-E-B. They stock them in their stores. I’ve also picked them up at JoAnne’s Fabric Shop. They normally run about $15 bucks a piece. It is a terrific investment if you enjoy donuts. Around Christmas time I had my husband shopping for donut pans when he found this one. 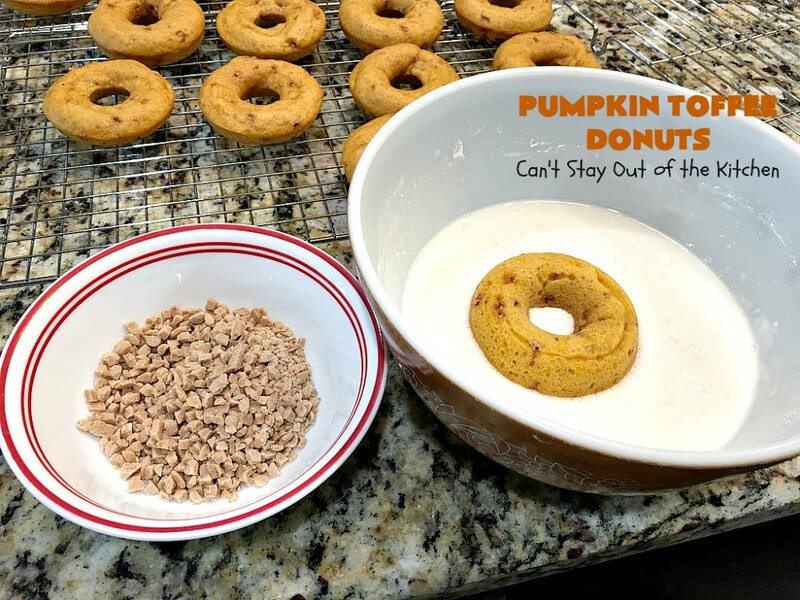 I love it because most of my recipes (single batch) do not go over 20 donuts. He picked up a bunch of them for me so I can bake a lot of donuts at once without constantly having to clean pans. 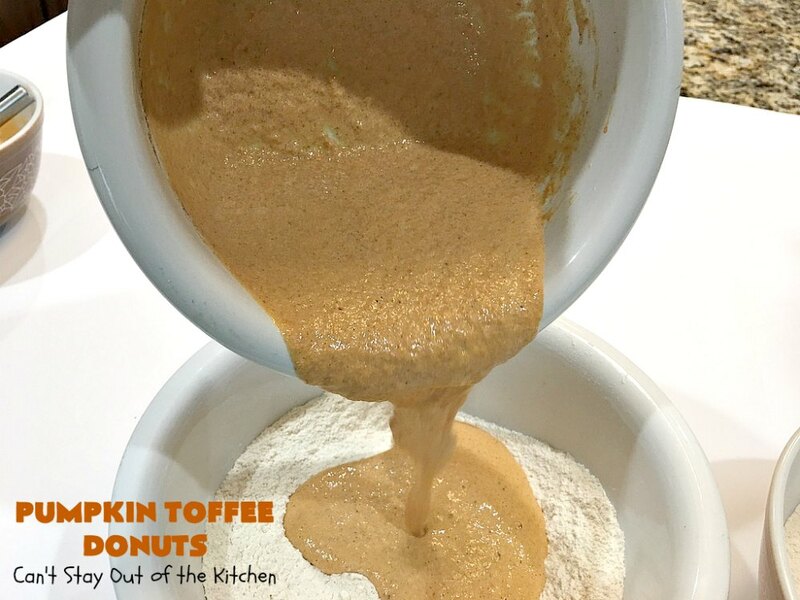 When I bake donuts, I usually go all out. By that, I mean that I usually make about 3 to 6 different kinds at a time. Sometimes I make two or three batches of a single recipe, but not always. I have to admit, I love the fun of making donuts. Many people prefer to decorate cakes. I prefer to bake donuts. (Never fry them). I would never make donuts if I had to fry them. That’s too much work. 🙂 Most of the time the donuts take about 10 minutes to bake in a 425 degree oven. Unless I overfill the cavities – then they may take 12 to 15 minutes. But that’s rare. I suppose you could call me the “Donut Queen.” I love donuts. They’ve always been my comfort food of choice. Thankfully, when I make them, I usually plan to share them with others and not eat them all by myself. 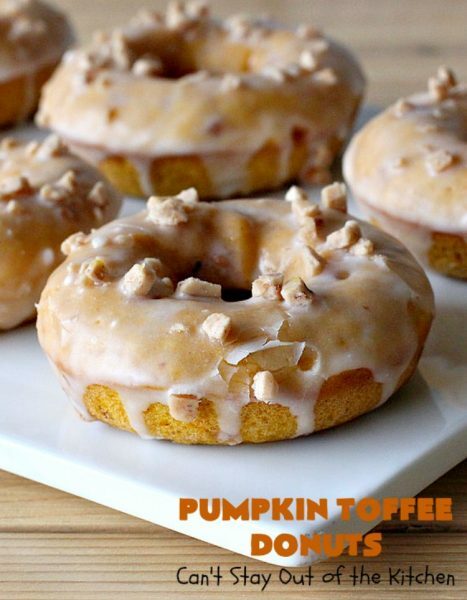 Anyway, if you love donuts too, you’ve just got to give these awesome Pumpkin Toffee Donuts a go. You will be drooling from the first bite. Yes, close your eyes and indulge. Pumpkin Toffee Donuts are irresistible. Every bite will have you drooling. 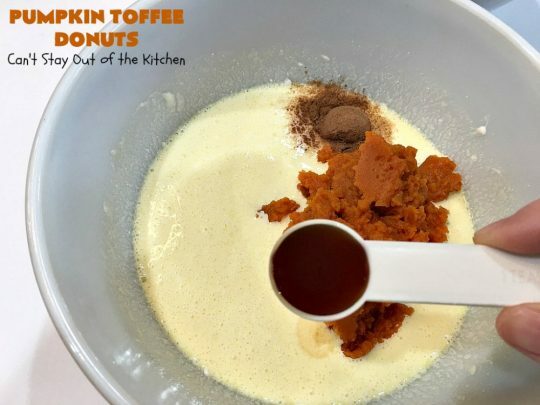 The Heath English Toffee Bits put these donuts over the top! 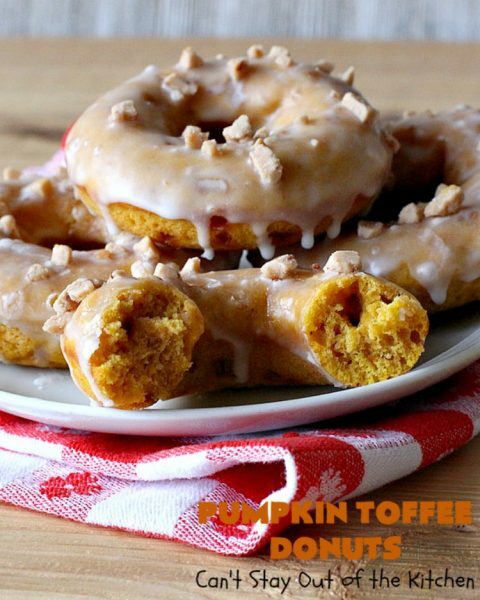 Pumpkin Toffee Donuts are some of the best donuts you’ll ever eat! 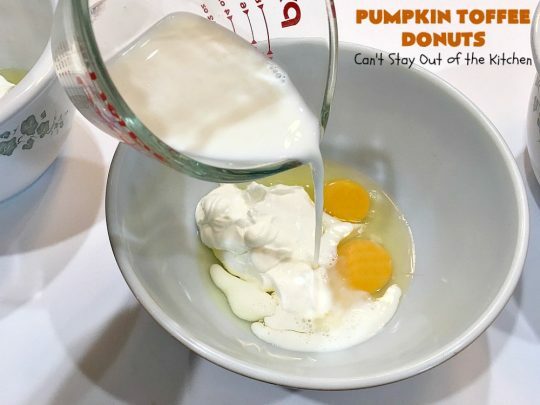 In a separate mixing bowl, combine eggs, sour cream and 2% milk. Now add pumpkin, pumpkin pie spice and vanilla. Combine pumpkin mixture with flour mixture. Add Heath English Toffee Bits. Stir only until just combined. 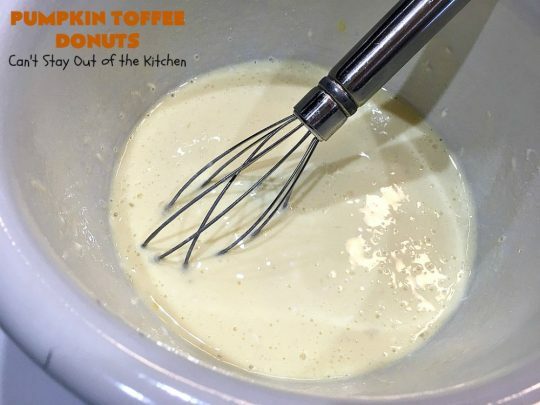 Do NOT overmix the batter. 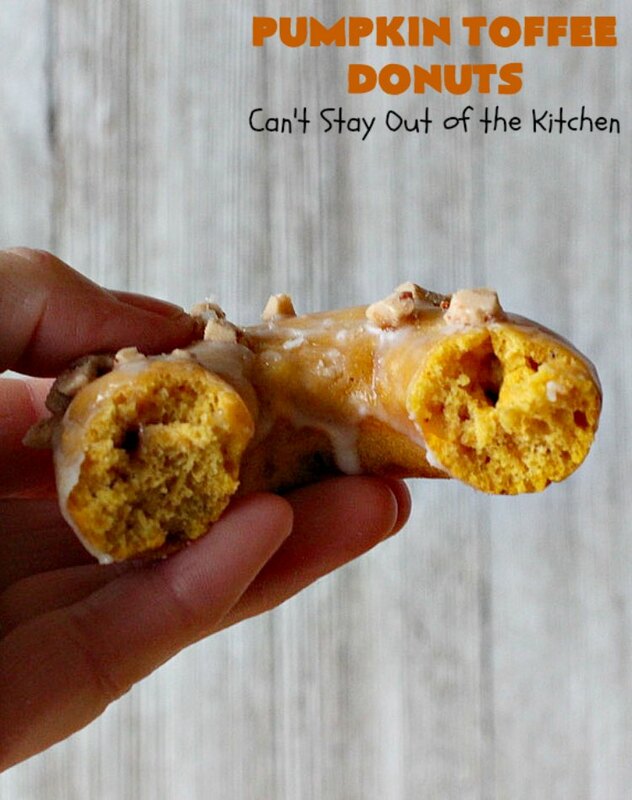 Spray donut cavities with cooking spray. Pipe donut mixture into each cavity. Bake at 425 for 10 minutes. Or bake until a toothpick inserted in center comes out clean and donuts are firm to the touch. 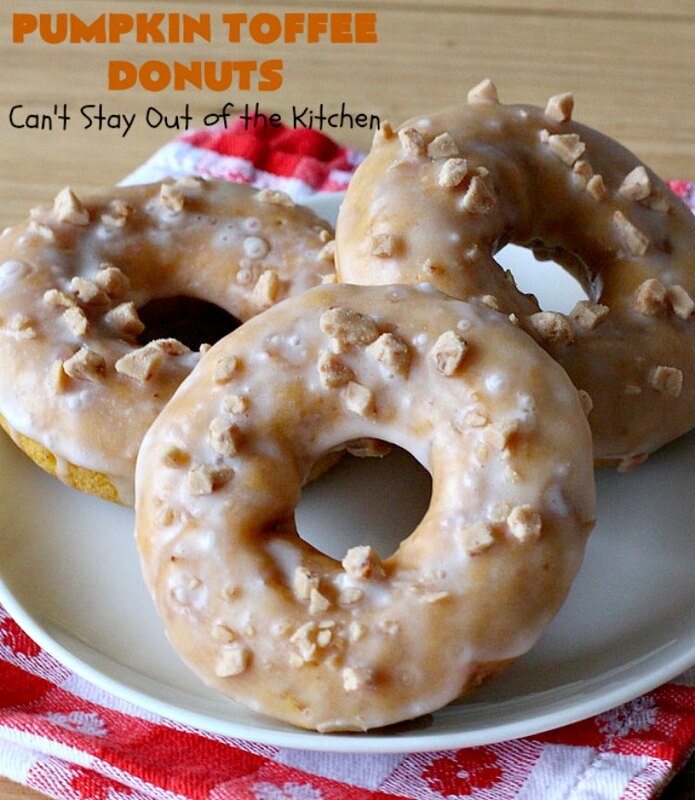 After a few minutes remove donuts from pan and place on cooling racks. 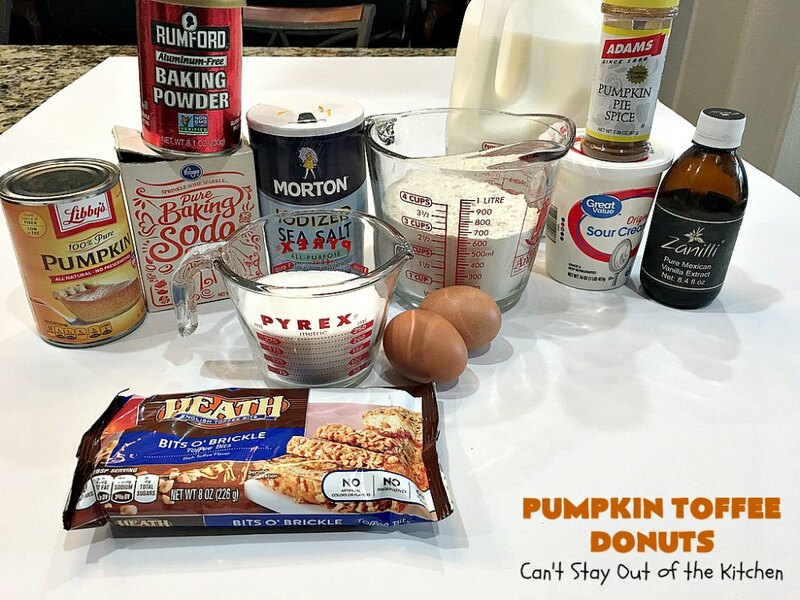 I used these ingredients to make the glaze. 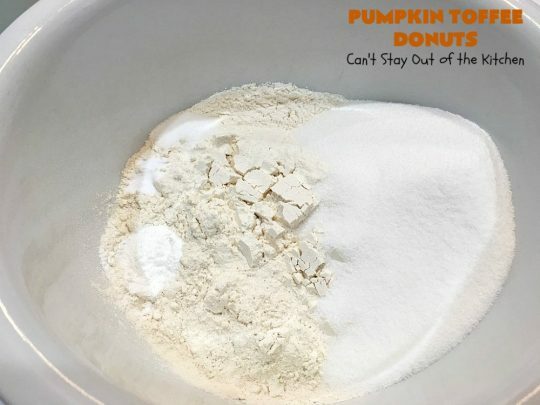 Combine powdered sugar with 2% milk and vanilla. Whisk to combine. Invert donut so the tops are dipped in the glaze. Place donut on cooling rack. 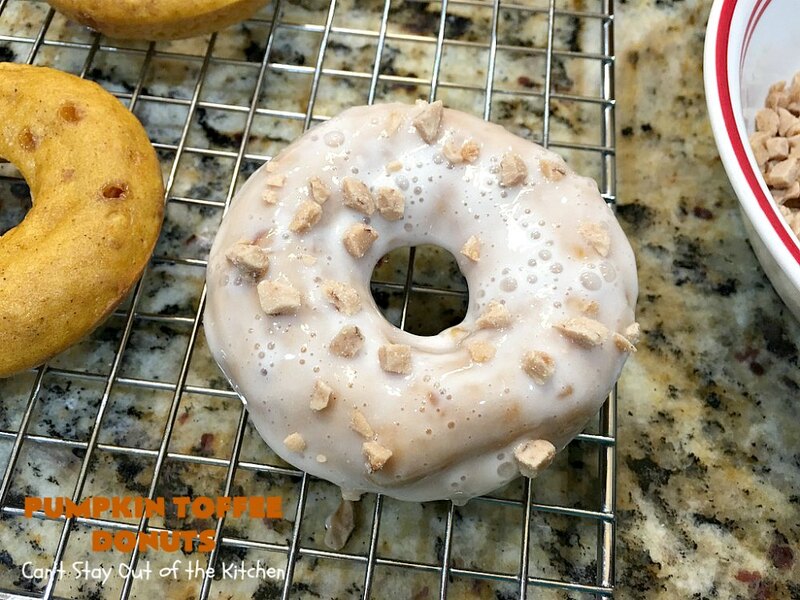 Immediately sprinkle Heath English Toffee Bits over top of each donut so they adhere to the glaze. After donut glaze dries (about 15 minutes) remove donuts to a serving plate. Pumpkin Toffee Donuts are great as day-old donuts too. I’ve eaten these a couple of days afterward and they are still good. Here’s the inside of one of these jewels. These luscious Pumpkin Toffee Donuts are absolutely mouthwatering. The donuts are filled with pumpkin, pumpkin pie spice and Heath English Toffee Bits. 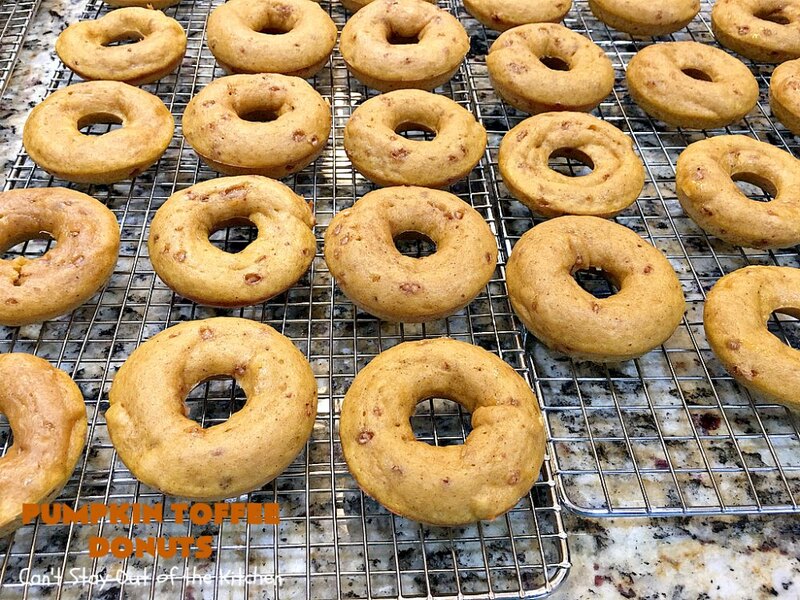 After glazing the donuts in vanilla icing, more Heath English Toffee Bits are sprinkled on top. 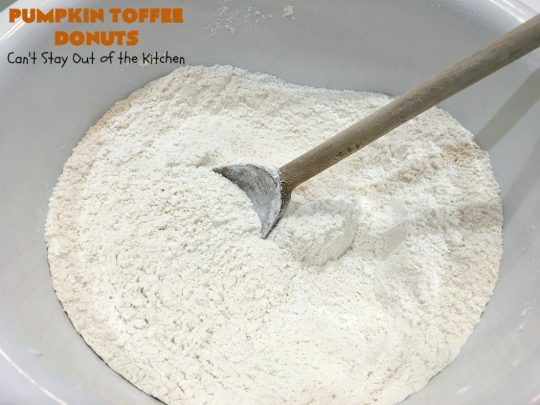 This favorite comfort food recipe is terrific for company or holiday breakfasts like Mother's Day or Father's Day. Your family and guests will be begging you for more! 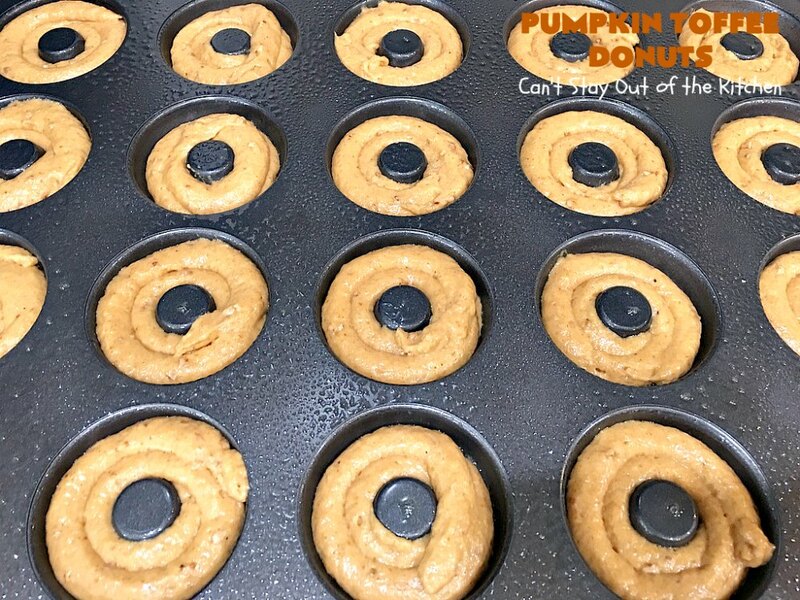 Spray 20-cavity donut pans with cooking spray. 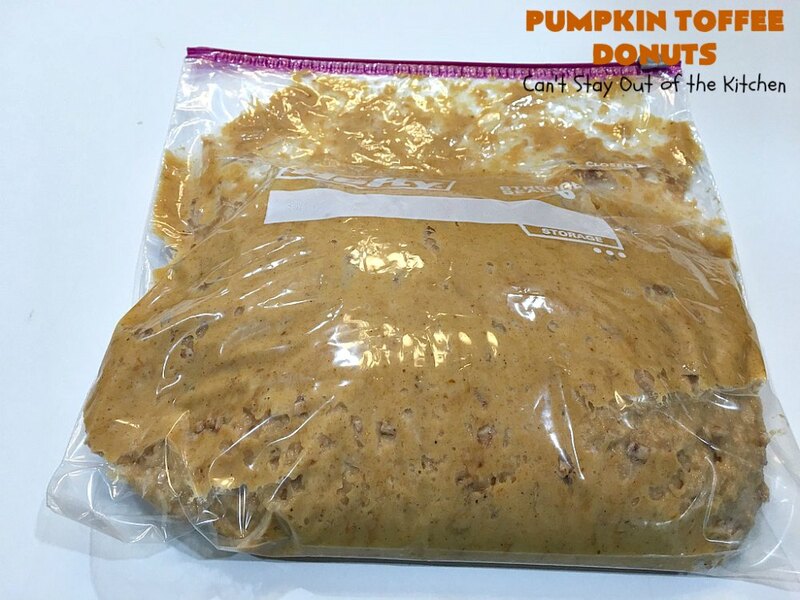 Whisk in pumpkin, vanilla extract and pumpkin pie spice. Pour the pumpkin mixture into the flour mixture. Bake for 10 minutes at 425 degrees or until the edges are lightly browned, and a toothpick inserted in center comes out clean. Remove pan from oven and cool approximately 2 minutes on a cooling rack. Dip baked donuts in glaze. 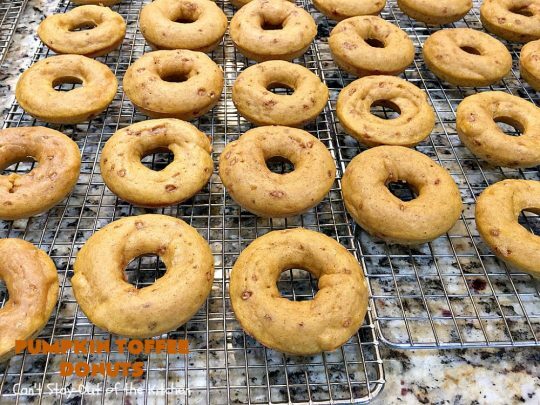 Place donuts on cooling rack and immediately sprinkle about ½ teaspoon Heath English Toffee Bits evenly over each donut. Do one donut at a time. Otherwise glaze will dry too fast and Heath English Toffee Bits will not adhere to the glaze. 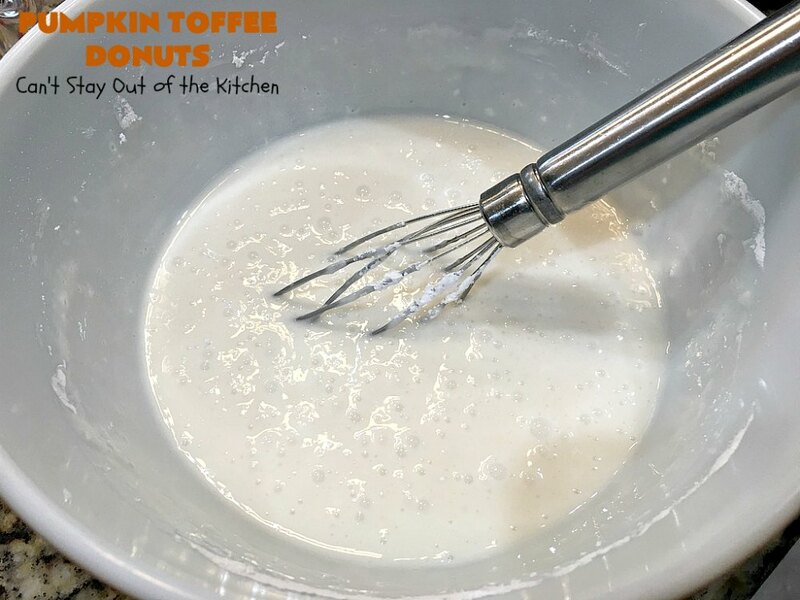 In a medium sized mixing bowl, whisk milk, powdered sugar and vanilla until smooth. 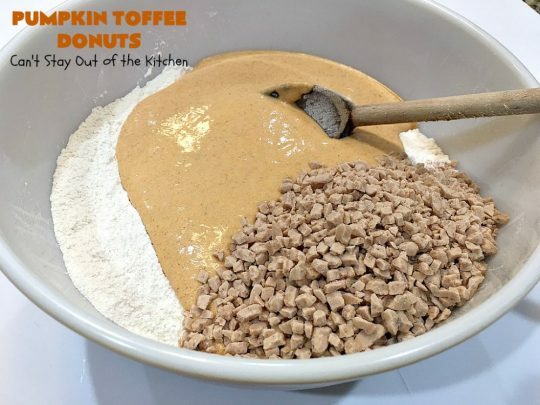 Immediately sprinkle Heath English Toffee Bits over top of each donut. NOTE: There is enough glaze for 24 donuts. 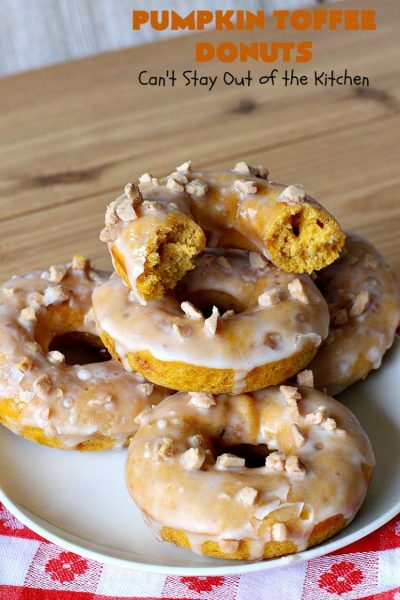 Pumpkin Toffee Donuts are extraordinary. I ate more than my share of these fantastic donuts. 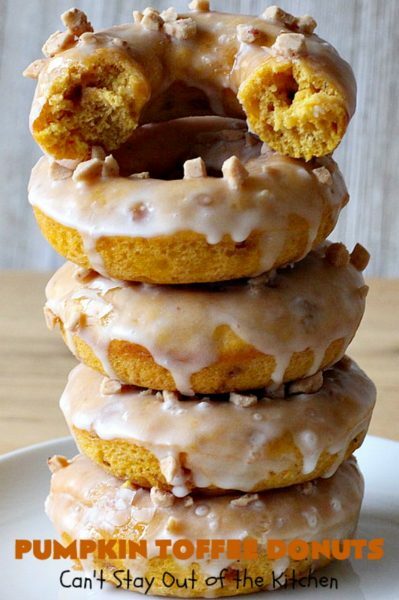 that’s a perfect dessert for donuts lovers and pumpkin donuts are so overwhelming. 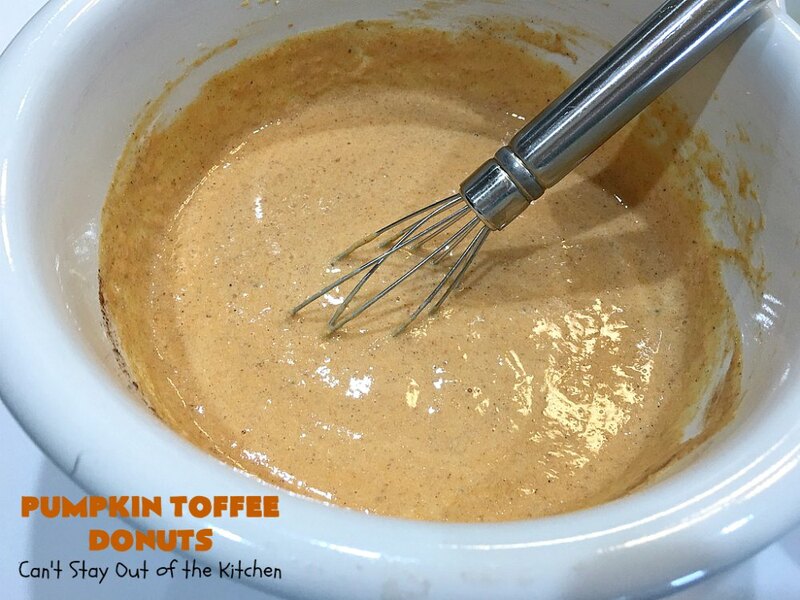 i’ve tried these and they turn out to be the best dessert for our family weekend thanks to you. This is perfect for kids who are not fond of eating vegetables. This is also perfect for this coming Easter and it looks delicious too. Gonna have to try this one soon. Hope you enjoy it. We sure did.